It’s 9:22 a.m. as I start this post. We are waiting for surgery. 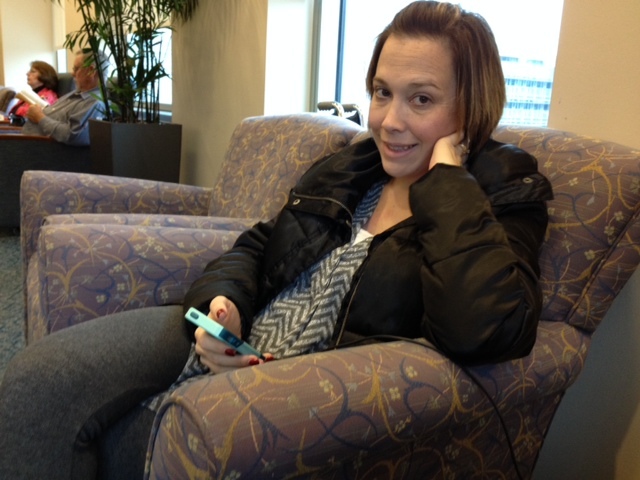 We’re in a common area on the third floor of the main MD Anderson building. Jenny is trying not think about food, but she’s already planned for us to order Pappasito’s takeout to the hotel this evening. Her appetite is currently much larger than the one she’ll have this evening, I think. Pappasito’s is attached to the nice hotel we are staying at in downtown Houston, so it’s in her head. Priceline gave us a very good deal at that hotel much better than the prices for much lesser hotels in the medical district area. Why are we waiting for surgery today? Especially after Jenny declared 2015 a surgery-free year? After getting cleared from the PICC line, the IV antibiotics and the surgical drain on Dec. 30, everything went well, until the following Saturday (Jan. 3), when Jenny noticed some redness on her left side. Over the next week, we watched her symptoms. Swelling. Redness. Low-grade fever at about 3 p.m. every day. Worn out. Aches. Nothing that surpasses the threshold enough to cause a trip back for treatment. Eventually (on Jan. 7), she had an ultrasound in Edmond, rather than driving down to Houston. That was a waste, really. It was inconclusive. There was not enough fluid in the area they could drain. And the radiologist didn’t know everything the surgeon had done with implants and Ala-derm and tissue, so it was impossible for her to know what exactly she was looking at. Jenny called back to Houston. Dr. Kronowitz said to stay in Edmond and watch the symptoms some more. After another discussion with Katie, the PA, we made an appointment for Tuesday morning (Jan. 13). They would work her in — maybe get another ultrasound and possibly change her antibiotics. Over the weekend, Jenny started itching. Her hands and feet and eyelids were itchy — really itchy. Weird. Just add it to the list. We drove down on Monday evening and showed up at the Mays Clinic at MD Anderson on Tuesday morning. Dr. Kronowitz looked at her, ordered an ultrasound and said they would drain the fluid. He said to come back after the ultrasound. They also changed her antibiotics. We walk back across the fifth floor of the Mays Clinic for another unplanned walk-up appointment with Dr. Kronowitz or his PA, Katie. They aren’t there, of course. They are in the building, but they are still in their other clinic offices on the eighth floor (where we met them earlier). Waiting at the Mays Clinic. A very helpful nurse calls around and get some answers. She reports that Katie says the next step is to go for an ‘ultrasound-guided breast drain placement.’ But she doesn’t know if they will be able to get her in that afternoon. If they can’t, Jenny will be admitted and get a room at the hospital. The news at this point is starting to get bad. The nurse returns with an update. By now, it’s about 2:30 p.m. The Diagnostic Imaging group that will do the next procedure will fit her in as an ‘emergency procedure.’ After that, they say we can drive back to Edmond. That’s pretty good news. At this point, we are planning for a late-night/early-morning arrival home. When we get there and get called back, we start to realize that this is a surgical-type of procedure where they often place the patient in mild sedation. But Jenny has eaten that day, so she had to use local anesthesia. There was a pre-op room and everything. This was serious business. They take her back, and I go to pick up the new antibiotic. I try to doze off for a few minutes as a power nap. I still think we’re driving home when she’s done. I make a list for the next day at the office. We’ll both be tired, but we’ll be back into the routine the next day with kids, school, home and jobs. It’s going to be a long drive. I plan our fast food stop and expect to be on the road by 6:30 p.m. or so. Katie calls Jenny’s phone as I’m in the waiting area. She tells me that the doctors working on Jenny have reported that they can’t place a drain or drain any fluid. She says that her and Dr. Kronowitz want to have a surgery the next day to replace Jenny’s implant on that side and clean out fluid that must be behind the implant. We need to see anesthesia the next morning and wait to hear for when time opens up for an operating room. That changes things pretty quickly. When I see Jenny, she has heard the news. She’s frustrated — this was not the plan. Another surgery makes her cry. They are supposed to call when they have a time for us. And we have a phone number we can call to bug them. 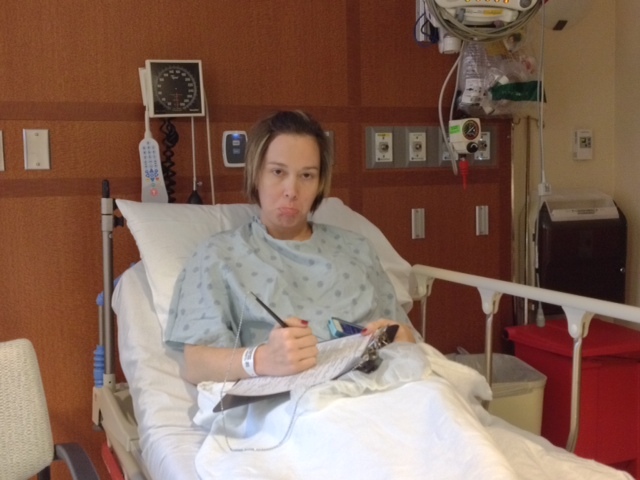 10:15 a.m.: Jenny gets the call to report to the pre-op area. We go straight to the fifth floor, and things get under way. The women at the surgery check-in area comment on how she’s lucky. Most ‘add-ons’ don’t happen until the later afternoon. From the pre-op room. 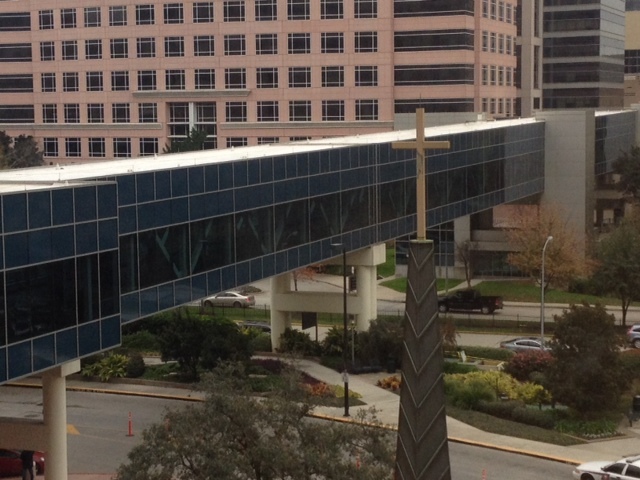 That’s the cross from the chapel and the skybridge to the Rotary House (hotel), the Pickens Tower and eventually the Mays Clinic. Jenny starts her paper work. She didn’t fill out consent forms yesterday, so this morning, there are a lot of forms to fill out. She’s not happy today, though she didn’t have this face the whole time. 10:45 a.m.: Katie comes in and gives us information about the previous afternoon — how the doctors trying to drain the fluid called Dr. Kronowitz and said there wasn’t anything there … how he barked back that ‘there has to be something.’ Jenny reported to Katie that they did indeed come back in a second time to take a closer look. That makes Katie and Jenny chuckle, because the second effort was after the radiologists talked on the phone Dr. Kronowitz. Katie added that the doctors on the phone were very nice, but they had to deal with Dr. Kronowitz insisting that there was fluid. That’s the reason for this surgery; They know there is fluid, but they can’t find it. She also assured Jenny that they had all different sizes of implants to replace the current one. She will not leave the hospital deformed. 11 a.m.: I make a point to thank Katie for getting her in this morning. “She’s not good without food.” Honestly, the timing of the surgery and the lack of food has been our greatest concern today. 11:15 a.m.: They wheel her back. Everything is moving quickly. A kiss good-bye and she’s gone. 1:30 p.m.: I get called back to see Jenny. She’s asks about what Dr. Kronowitz said. I tell her. “That’s what he always says,” is her reply. She’s doing pretty well, but as always after these surgeries, she’s tired and hurting. 2 p.m.: I leave to go get her prescription. I thought the pharmacy tech was crabby when he told me I’d have to wait 3 hours. “I have to type this stack in!” But the pharmacy on the 10th floor might be better. So up to a new area of the hospital I go. Who knew about this pharmacy? They tell me it’s an hour wait at this place. 3:15 p.m.: I tell the above story only to complete the story …After returning to pick up the meds on the 10th floor, I make my way back to Jenny’s room and past the pharmacy on the 2nd floor. I happen to walk past the crabby tech in the hallway (maybe he was on break? ), who recognizes me after a double-take. He asks if they were able to help me out on the 10th floor and apologizes that they are ‘so backed up down here.‘ He was pleasant and helpful, which made me feel bad for being crabby back at him an hour earlier. Then it made me resolve to make another attempt to (1) not be crabby with people, even if I have a lot of stress at the moment and (2) not be too judgmental about people who are crabby to me — in most cases, they have a lot of stress at the moment. 4 p.m.: We’re on our way out. But not until the anesthesiologist who discharged her lamented at the new laws that give patients ‘crappy pain medication.‘ She gave Jenny one good dose of the old-fashioned pain meds (because she has the special permit that allows her to do so.) That shot of medication allowed Jenny to ride in comfort on the bumpy Houston roads and in comfort even after I accidentally bumped her wheelchair into the elevator door at the hotel. 5:10 p.m.: She’s in relative comfort right now. And we are planning our drive back to Edmond and back to normalcy tomorrow. It’s 5:27 as I finish this post. Just know that I will finding her some food very soon after she wakes up! Traditional photo of evening rest. I am so glad they found the fluid and I’m impressed the doctor wouldn’t let the issue go! You are well taken care of, Jenny! I’m praying for quick recovery and absolutely no more infections. What an ordeal. I hope you both sleep well after all that. Safe travels home tomorrow. So sorry to hear another surgery was needed. But happy that the doctor was insistent on getting to the bottom of the problem. Prayers for comfortable ride home, and prayers for a complete healing! I’m glad they figured out was going on. What a relief to have some answers. You guys must be exhausted! So glad they found the problem & fixed it (we hope). Drive carefully tomorrow. The kiddos can’t wait to see you & neither can Heidi. Harper is quite noncommital. You are very lucky to have such caring, skilled medical people, Jenny! May this “bump” be the last one and may 2015 be kind to the Herzbergers from here on out! Good grief. I’m saying prayers that this your last trip to Houston. As I said earlier, I’m so glad she has you to take such care of her…and feed her when she get hangry. (It’s a family trait. What can we say?) We love you both. Safe journey home, Herzies! Alan, thanks for the great update. So glad they were able to find and fix the problem. We look forward to you both coming home tomorrow. Didn’t sound like Jen will have to return to the hospital to see Dr. K before you leave tomorrow. With that in mind, I sure hope you were able to pick up a peanut butter stack for Jen today. Jen believes, I’m sure, that getting a peanut butter stack always makes the 7 hour trip to MD Anderson totally a worthwhile event. Oh yeah, having the fluid drained was also good. Drive carefully, don’t speed, don’t follow to closely, blah, blah, blah. You know the routine. See you both real soon. Now I know why you guys are driving to Houston for care. Great doctors. Let’s count 2015 as starting in February. Still a surgery-free year ahead for you. I’m so glad I know how strong Jenny is and what a supportive family she has. Continued prayers. Thanks once again for a thorough update, Alan. Praying for complete healing and safe trip home!